Sales & empowering speaker. Fascinated by human behavior and interaction. The basics are good to follow, but the NEW ways are even better to get results. Millo is an engaging, current and creative sales speaker, video blogger, social media expert and a writer. Millo motivates and empowers all of those who meet him to sell themselves, represent something they believe in so they can share it and profit from it. He studies human behavior, then transforms it into a contagious behavior. Millo teaches you the power of words, body language, to love people, take action and engage with others. All of these things combined to reap the benefits of becoming the best product anyone has gaze their eyes upon; YOU. 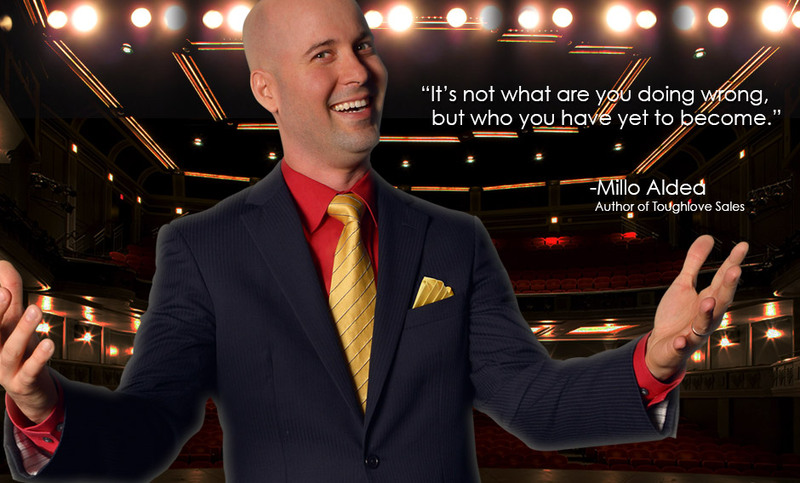 Millo has written, produced, marketed and directed theater. Produced and directed a reality show series. Created two social networks. Two short film competitions won. Recorded and produced 2 music albums. Creator of brand new online technology. Helped build the brand of over 30 nation-wide known products for companies such as Disney IDEAS, Crescent Heights of America, Leo Burnett, BMG, Sony and Latino-MSN. Develop yourself into the best product anyone has laid their eyes upon and you will be a magnet for success. Read from the best. Listen to the best. Learn from the best. Love like the best. Give like the best. Speak like the best. Sell like the best. Deliver your best. Earn like the best. Be the best and accept nothing less than your best to become the greatest.